But what bugs me is that after all the hard work getting people to a website, the majority of them wont stick around long enough to have made the work worth while. What if you could get a second chance at all these website abandoners? A way to pull their attention back to your site, to capture their email, or give them a special discount or alternative offer before theyre gone for good! 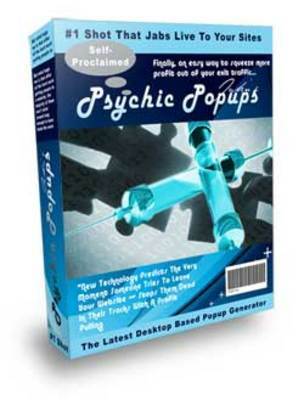 Psychic Popup Injector is a desktop application, you can use to generate the little exit traffic salesmen. As soon as they get a sense someone is about to abandon your site they jump into action, funnelling the traffic where you want it to go before its gone forever. Promoting Affiliate Programs - Make sure everyone knows about the latest affiliate program youre promoting just as they try to leave your site. Exit Surveys - Ask your visitors why they are leaving and youll get all the information you need to improve your offer and increase your profits! You can put an Psychic Popup Injector salesman to work on any webpage in under 30 seconds. After that it works for you everyday, regenerating your traffic and channelling it back into your marketing funnel. Psychic Pops pops;popupblocker;websitepopups 90167608 12.00 sinjatin Fresh Download Available!